Have it and make your home better. A variety of accessories to meet your different needs,Stainless steel Cable can be easy trimmed to any desired length. WHAT YOUR GET? 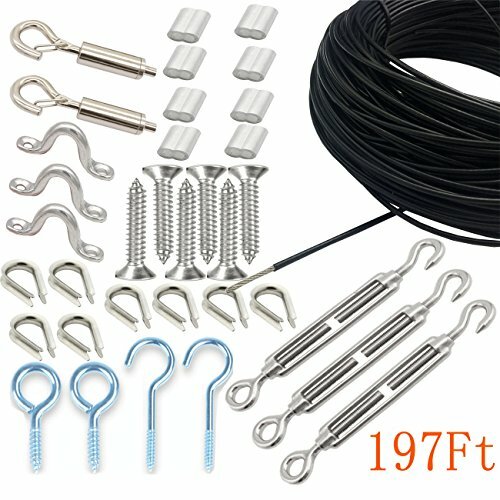 - Stainless Steel Globe lights Kit include 1/16 inch in diameter 197ft outdoor light guide wire × 1,Turnbuckle × 3, Attached Snap Hook × 2,Screw Eyes Lag Thread × 4,Aluminum Crimping Loop Sleeve × 8,Thimble × 8,screw × 6 ,Eye Straps × 3. CONVENIENT FOR USE - A variety of accessories to meet your different needs,Stainless steel Cable can be easy trimmed to any desired length. AMAZING ACCESSORIES - All accessories are made of high quality materials, strong and durable, can meet your long-term use, the need for repeated use, is a good assistant in your life. SIZE - Outdoor light guide wire -1/16 inch in diameter ×197ft,Turnbuckle × M5,Aluminum Crimping Loop Sleeve × M2,Thimble ×M2. If you have any questions about this product by UNIYO, contact us by completing and submitting the form below. If you are looking for a specif part number, please include it with your message.